I made a dinner last night that brought more “Oh my gosh” and more “Mmmmmm” and more “Oh this is SOO good” responses from my wife and daughter than any recipe has before. More than the French Fries, the Biscuits, and even the Cheese Sauce combined! This is easily going to become our new all time favorite recipe – no question about it. I finally outdid myself, and I did it with Tofu. I remembered years ago when I worked at Intel in New Mexico. Their little cafe would serve the BEST Breakfast Burritos I have ever had. 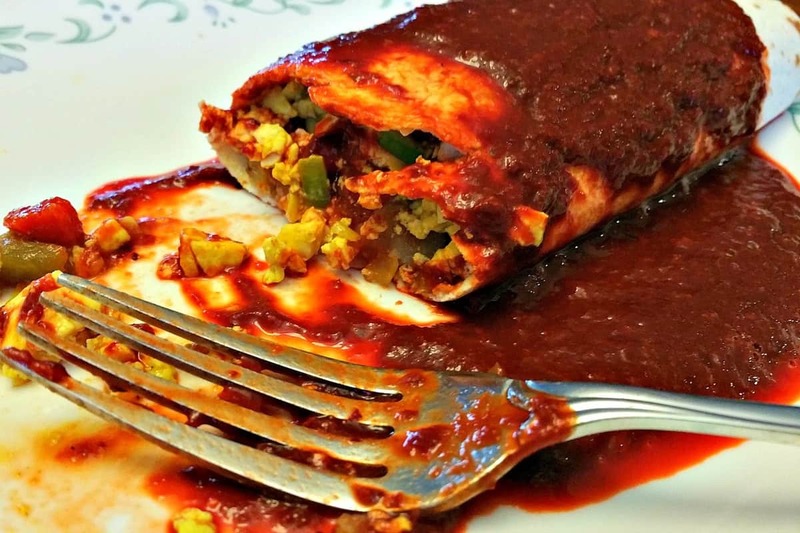 Gigantic flour tortillas stuffed with scrambled eggs, sausage, hash browns, and green chile – and then smothered in Red Chile Sauce and Cheese. OMG those were SOOOO good. That was my answer. Breakfast Burritos. Veganized Breakfast Burritos of course, with scrambled Tofu in place of the eggs. And let me tell you, these came out simply AMAZING! The Red Chile Sauce is what sends these babies over the top. If you haven’t made any yet, it can seem a little daunting at first, but oh it is SOOOO worth it. And no, Red Chile does not necessarily mean spicy. Red Chile from New Mexico has a distinct, earthy flavor that you just can’t find anywhere else. So don’t be afraid this sauce is too hot or spicy – mine came out absolutely perfect. In your Hispanic Section of your grocery store you should be able to find bags of dried, New Mexican Red Chile Pods. You’ll need about 20-25 pods – so an 8oz bag should be plenty. Lay these pods out on a cookie sheet and roast them in a 250 degree oven for about 15 minutes. Your kitchen will smell heavenly! Carefully cut off the tops, clean out the seeds, and then drop the cleaned pods into a stockpot with about 4 qts of boiling water. Let them steep 10 minutes or so until they become nice and soft. Add the softened chiles to your blender with 3-4 cloves of garlic, 2 cups of the steep water, 1/2 tsp each of garlic powder, onion powder, ground cumin, and oregano and blend until smooth. Then add in an 8oz can of Tomato Sauce and about 1/4 tsp of salt, blending on high until the sauce is nice and smooth. At this point you can strain the sauce through a fine sieve, or leave it as is. Straining the sauce does make for a smoother sauce but does take more time. For a more rustic look I did not strain mine. I like hash browns in my burritos, but you can leave them out if desired. Many people have asked me which brand I use, and Mrs. Dells is what I buy at my local Walmart. Their only ingredient is potatoes and contain no oil or preservatives. Heat a small skillet on medium and pour in your frozen hash browns making the thickness even across the skillet. Add a lid and cook for 20 minutes or so. Carefully removing the lid, flip your potatoes (they should be nice and brown) and cook for another 5-10 minutes. This is the easiest way I know of, of making golden brown, fat-free hash browns. This recipe was adapted from Happy Herbivore’s basic Tofu Scramble. It is remarkably easy to make and just requires a 14oz block of Firm Tofu. (Extra Firm would work too). Drain the block of Tofu and set it on a plate with folded paper towels under and on top. Set another plate on top and weight it down. (I used a few cans of beans). Meanwhile saute a clove of garlic, about a cup of chopped leeks (or onion), 1/2 a red bell pepper, and a 4oz can of green chile until softened. Use a splash of Vegetable Broth or two to keep things from sticking. When the veggies are soft, add your block of Tofu and start chopping it up with your spatula. Add in a tablespoon of nutritional yeast, 1/2 tsp each of garlic powder, onion powder, and turmeric with 1/4 tsp each of ground cumin and salt. Finally stir in about 2 teaspoons of Dijon Mustard. Keep scrambling and chopping with your spatula to incorporate all the spices. Your tofu will soon take on a yellowish color and you’ll swear you’re scrambling eggs because the color and texture are so close. Who knew bean curd could taste so much like eggs. Seriously if you didn’t tell someone what they were eating (non-vegan spouses etc) they would never know the difference. Warm up some of your favorite oil-free flour or GF tortillas and pile them high with the Tofu Scramble and hash browns. Wrap tightly and smother the whole thing with Red Chile Sauce. This is how I remember the Breakfast Burritos from New Mexico. Yum, and after typing this post I am going to have to buy some more Tofu. 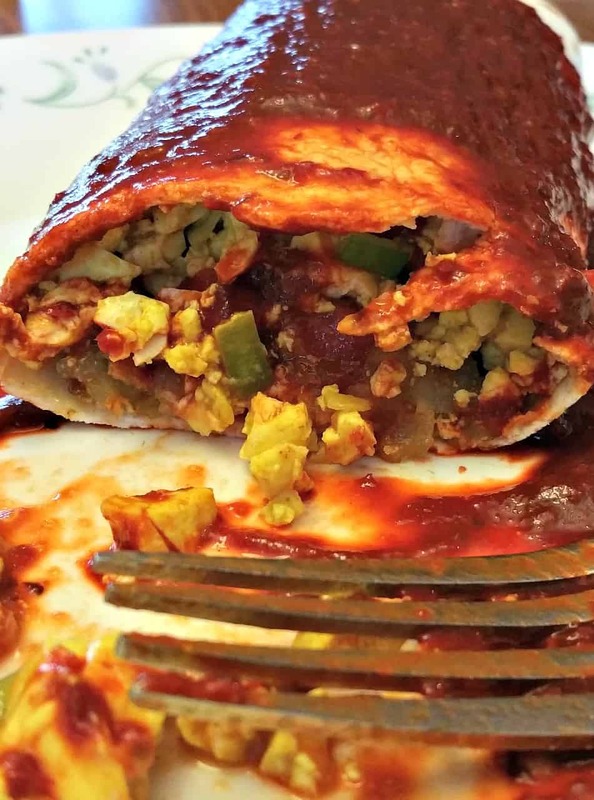 Veganized Breakfast Burritos - New Mexico Style. Southwestern scrambled tofu and potatoes smothered in a rich red chile sauce. My new favorite recipe! Top with Vegan Sour Cream or my Amazing Vegan Cheese Sauce. I lived in Rio Rancho for 10 years. And yes, New Mexico food is the BEST! The chile, the rellenos, the sopapillas, mmmm. We loved the old Gardunos over on 4th street. I hear they close sit down – so sad. I always have a hard time finding the tortillas without oil. Which brand can you find and where do you find it. I can get corn tortillas but never flour. I can make them but sometimes I wish I could just have them made before I start cooking lol. I only find red chilies from Mexico… I always thought they were hot; are they the same? My local grocery store, as well as big chains like Walmart sell the dried red chile’s in a bag. Look in the ethnic section, or Hispanic section. They should be labeled New Mexico Red Chiles. And no, these are not very hot. I cannot find flour tortillas without added oil. What brands, if any, have no added oil? Whole foods has a 365 brand that is oil free. Or you can always make your own. La Tortilla Factory makes whole wheat or white flour tortillas that are 98 percent fat free. They use aluminium free baking soda and no oil, just flax seeds to give it fat.